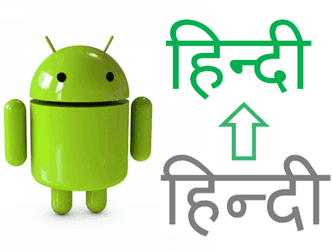 Stand Alone Unicode Download android's Hindi font for Desktop. Devanagari texts in android gadgets have a unique modern unicode font. Every application and features in an android mobile uses the same Hindi font. This minimal font is easily viewable in very small font sizes. This font is used in only android devices so it is limited to our hand held devices. Now what if we want this font for PC. It's possible to use this font in windows like we do in android. A true type font file is available to download here. So if you want a modern minimal Hindi fonts which mostly used only in mobiles and tablets is now available here. Download and install this font in to your system. After installing this font you can use this font in place of your default Devanagari font. Generally Windows 7 and earlier versions uses mangal as a default Devanagari font. So NotoSans Devanagari will replace your current mangal font if you are using these platforms. If you are using windows 8 or 8.1 then your default Devanagari font is Nirmala UI which is quite good looking font. But mostly used in very condensed form. Using NotoSans as a default font in windows 8 will replace Nirmala UI as a new default font. After installing the font you can use this font in your internet browsers and other places such as MS office. Read: How to set custom Devanagari font in various internet browsers. This is NotoSans Devanagari font available in two subfamilies 1) Regular and 2) Bold. Font name: NotoSans Devanagari, zip size: 155.1 KB, Download font. (Important: Please read attached file before installation).